Hello Stitchers! Today's the day I get to show you what I made for Clair's Stitching on Paper class. Remember the sneak from a couple of weeks ago? 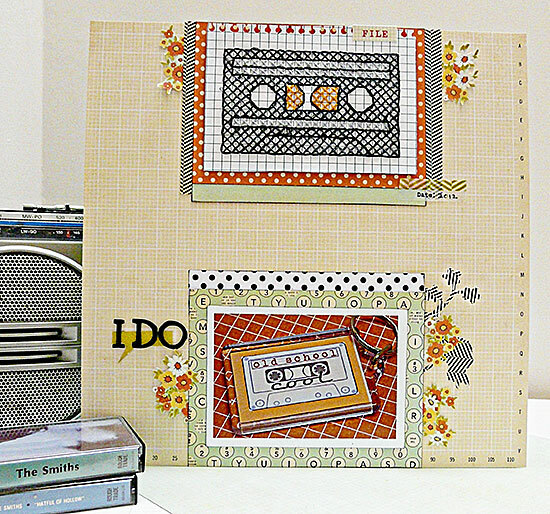 I know lots of you loved the sound of more sewing on your pages (genius idea for a class, Clair!) and have been joining the lessons each Saturday and Sunday. If you haven't already checked it out, you need to head over to Obstinate Pursuit to pick up all the tips. You can download the lessons if you follow the links and catch up on quilting, embroidery, stamping, machine stitching and sewing by hand. There is a prize involved too - go, see! An old cassette to go a page about a little keyring I bought recently. I do old school cool it says and I have nothing to add to that! and that brings me to my next thought. I didn't stitch this right onto my background paper. I did it on a separate piece I could stick on when I was finished and satisfied with it. That way, I wasn't going to spoil my entire layout if I lost my concentration and started poking lots of holes in the wrong place! piercing holes - it might sound obvious to say use a paper piercer. But use a paper piercer.For years I pierced holes with a needle, then I decided to buy a piercer and I'm very glad I did. It does make things easier. I only pierce a few holes at a time, stitch and then pierce some more. It limits the accident potential. remember that your choice of square size and number of threads you use will affect the look of the finished motif. I wanted an open, modern feel here for an 80's effect - think Madonna's lace fingerless gloves, or a pair of fishnets - so I used big-ish squares. Small neat squares would look neat and traditional. like any cross stitch it mightn't look like anything until you put the details on. So persevere with the back stitch and watch it come together. start small - maybe with one cross stitched alphabet letter? You don't even need to stitch the whole thing: let it drop of the edge of your page like you do with an embellishment. But always remember - I'm going to say it again - it's on paper, it doesn't have to be perfect! 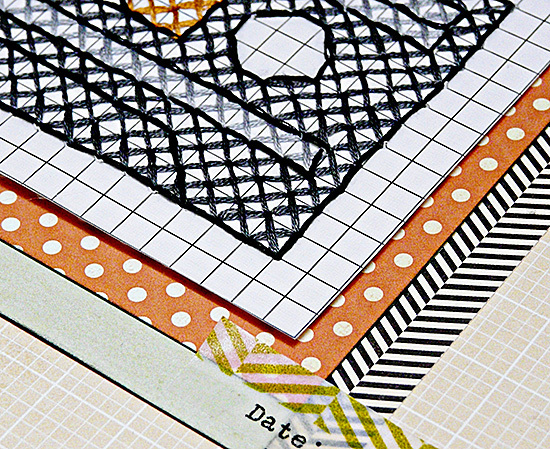 So head over to Clair's and see what she has for you, download the pdf's, thread a needle and link up your project. Let's stitch. What a fabulous idea to combine both crafts. I had never thought of using cross stitch so extensively on a page and now you have me thinking how to incorporate it into my pages! Okay, big breath Amy ... don't laugh .... I have never done a cross stitch. Seriously. Anyway, your page look fabulous! 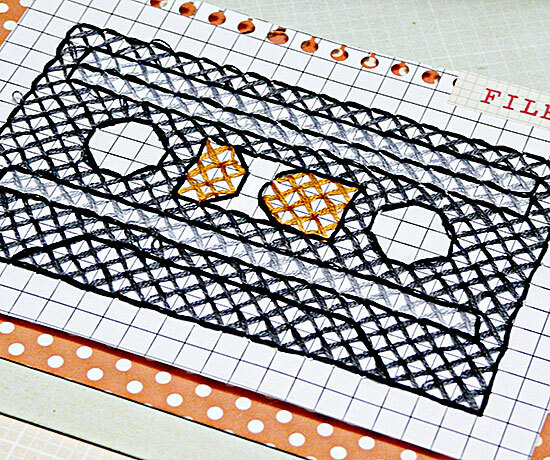 Love the way you have made the cross stitch cassette. Would never have thought of doing that, and I love your tips about making the stitched element on a seperate piece to avoid tears and tantrums if it goes slightly wrong! Fab fun page - a LOT of work though! Just wonderful! So exciting to see our old passion used in scrapping!! Still considering finishing some cross stitch projects. Maybe this winter. Great! I used to do a lot of cross stitching before I got into the scrapbooking! I do add stitching to mympages now and again butninwouldnt have thought of stitching a whole embeliishment like that - it's brilliant! I have done cross stitching in the past and loved it, but I probably took on bigger projects too soon and then never finished them! I still have thougths of bringing it all out in the evening and start again :) Perhaps this will inspire me to. A great idea of reviving cross stitch for another purpose. I was explaining to the kids that the first ever tape I bought was by Madness in the early 80's - I'm not sure if they understood what I was talking about! Love it & your key chain. My daughter just bought a cassette case holder for her IPod - too cool! I love it! Now I know what to do with all the left over embroidery threads I have from when I used to do lots of cross-stitch. Your layout looks lovely and the cross-stitch definitely adds to it. i love the "old school" look of this! and the texture is amazing. this is a great technique to add an extra punch to any piece of art. Would never have thought of cross stitching on a LO..it looks really effective! Very cool and I love your pointers! p.s. love that you had 'sfair' as a security word...spooky!! I love your new look too Sian. I started a tiny cross stitch ages ago, (lodging in the 'to finish' box now) I think looking at your page it was too small for a first try. Thanks for the inspiration to try again on something a little bit bigger! fun - in my list of pages to do is one about cassettes, from when Wookie used to make up mixer tapes all those years ago. i am really enjoying this series, and strangely i still have hatful of hollow on tape..............we r twins aren't we? Hello! Shame on me for being so far down the list of comments (I did visit early on Sunday, but your post wasn't up then and I had to dash off to meet my dad.) But, it is amazing and it's lovely to read about the page in your own words here - it was so hard to put into words how amazing I felt it was. I hope that came across in my write up! THis is so amazing!!! What a fabulous idea! LOVE! I was just thinking about getting my cross stitch out again as my boy seems to getting the hang of a needle. I love the little cassette - so cute! Hmmm - never heard of a paper piercer I'll have to check that out.